Screen shot from Levi’s Stadium app showing active in-seat delivery option. 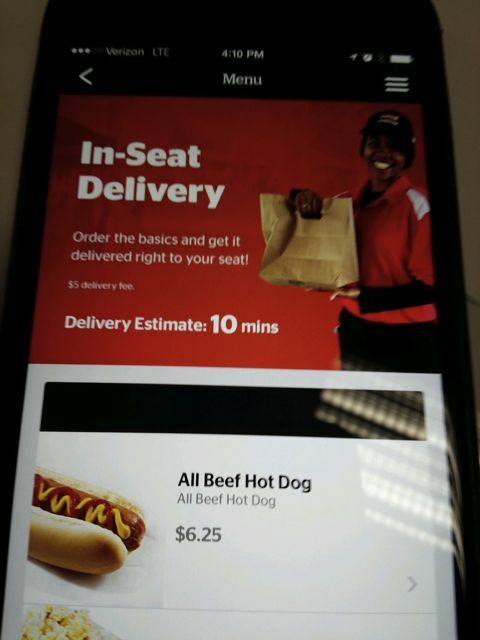 Having a mobile app that allowed for in-seat food and beverage delivery helped produce $802,791 in revenue at Levi’s Stadium last season, according to San Francisco 49ers execs Wednesday. In a panel presentation at the Veritix Sports Facilities & Franchises/Ticketing Symposium presented by SportsBusiness Journal/Daily in Santa Clara, Niners chief operating officer Al Guido and VenueNext CEO John Paul presented some statistics about Levi’s inaugural season, including the $800 grand number for both in-seat orders and express window pickup orders, which are both facilitiated by the VenueNext-produced Levi’s Stadium app. According to Guido, the split between the two options was a surprise, with in-seat accounting for 54 percent of the total, against 46 percent for express window pickup. However, he isn’t mad about the outcome, since he said stats showed that fans increased their average spend for delivery orders by two to three dollars per seat by the end of the season. Though Guido and Paul didn’t mention any concrete new options planned for the upcoming football season, Guido wondered out loud about ideas like dynamic pricing of concessions, such as having half-price hot dogs advertised through the app. Overall, Paul and Guido said that the Niners had 203,925 unique users of the Levi’s Stadium app last season, including 65 percent of the team’s season ticket holders, who now manage their seats through the app. Guido also said that if there was one area where the Niners could have done better it was to improve the experience outside the stadium, namely the parking and public transportation services, which experienced numerous problems during the Levi’s Stadium opening season. “We probably didn’t focus on it enough,” Guido said.